Top of de mornin' to ya! Welcome to the ninth stop on the hop hosted by the wonderful Nicholette of Beyond Scrapin! 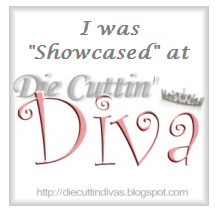 This post is doing double duty because today is my design day at Crazy About Cricut and Creative Cutter Room. For this hop, it is my pleasure to join such talented ladies for this hop. Thank you dear! If you came from Cricut Confessions, you are in the right place. If not, click HERE to start at the beginning and get in on all the action. I've posted the entire hop line-up at the very bottom of this post in case you get lost. For today's projects, yes two, I created a card and a treat box. Now, I will not bore you with details so, if you'd like to know more about the projects, just email me at askscrappinsista (at) hotmail (dot) com and I'll respond. CANDY: Everyone loves candy! For today's giveaway, the winner will be able to chose any 3 single digi or cut files from Papercrafting World. Melin is so sweet. I love her work and she is so generous. I also have a small SURPRISE goodie prize that I may give away to a second winner. We'll see how it goes. Be sure to leave a comment below including a name and email addy in case you win. Please be safe and post your email using (at) and (dot) or something similar to cut down on hacking. Well, that's all for now. Slide on down the rainbow and over to Martha's place. I'm sure she'll knock your socks off! DON'T FORGET!!!! Click HERE to enter my follower giveaway that ends at the end of this month. Happy Scrappin'! Love the two shades of green on the projects. very neat treat box. Love the card them embossing, shamrock glitter shaker and cool white border are awesome. Happy St. Patrick's Day to you!! I love both your projects. I must get the details on that treat box, it's so cute. Your card looks fantastic with the embossing and stitching all around. Thanks for a chance to win. Great box and card. Thanks for sharing. I love the card, and the treat box is adorable. Love your treat box and card! Great job! Great projects... I love your card! Thanks for sharing them with us! Happy St. Patty's Day! Your card and treat box is awesome!! Thanks so much for being in my first blog hop. Happy St. Patrick's Day. Great projects love the treat box and the card. TFS. Happy St. Paddy's day. Really cute projects,Send a bit of your gold this way. OK chica, you know I love this! I love the box, it looks SOOOO complicated to make yet is so pretty, and that shamrock shaker is too cool! You know I am your stalker, I love your style. Love your projects! Very nice work! TFS! In any case, the work was worth it ... your projects are adorable. I especially like the treat box. TYFS and for the opportunity to win blog candy. Love all the embossing. Those look GREAT! Cool treat box! I have that cartridge, will have to make one! Fantastic treat box and card. Hey my sista from another mista! I feel like I've been gone for too long. THese are super fabulous I want that box!!!! Love your projects..really love that treat box.